Do more with your health apps. 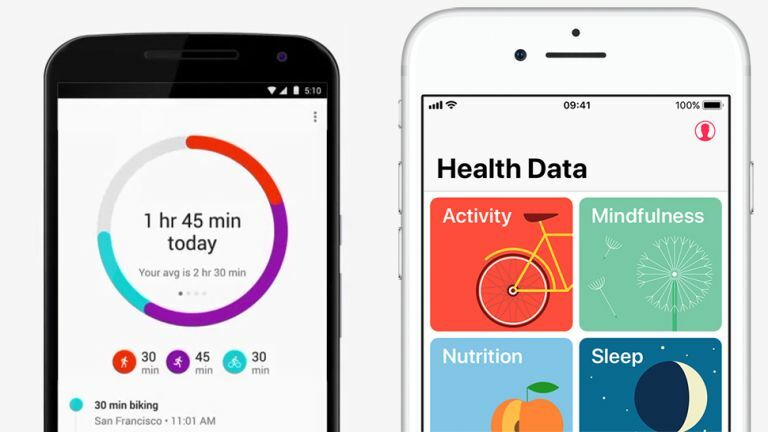 Both Google and Apple offer fitness tracking apps for their respective smartphone operating systems, so you don't necessarily have to download a third-party app to do the job if you don't want to – Google Fit and Apple Health have all of the basics covered. These apps will pull in data from the sensors on your Android phone or iPhone to collate statistics like steps taken in a day, but you can also get third-party devices to feed through information as well. These are some of the best compatible gadgets you can buy right now. Apple's latest and greatest smartwatch syncs perfectly with Apple Health because of course it does – you wouldn't expect anything else. From workouts to heart rate, the watch can track just about everything you get up to, and sync everything back to your iPhone. On top of that there's a whole lot more to the watch than health and fitness, including app alerts and the ability to make a call without a connected phone, but if you're wondering what the best wrist-based tracker to use with Apple Health is, you're looking at it. Over on Google's side of the fence, the LG Watch Sport is perhaps the best of the current bunch of Android Wear smartwatches. As you would expect, Android Wear syncs seamlessly with Google Fit, so all of your steps and other vital statistics get logged. As well as that you get some nice (if chunky) design touches, the usual broad selection of watch faces, and tight integration with the apps on your Android phone. The watch can pair with an iPhone, but it won't work with Apple Health, and there's no Google Fit for iOS. It might not win any prizes for its looks, bit the Mi Band 2 is a perfectly capable fitness tracker that will sync up with Google Fit and Apple Health no problem at all, through Xiaomi's own app – you can then study your fitness data in whichever app you prefer. With a waterproof design, a bright OLED display, and battery life that goes as far as 20 days, there's a lot to like about this tracker. You don't get any integrated GPS, but it can measure your heart rate, your steps, and your sleep, as well as remind you to keep moving. Any Misfit tracker can plug into Apple Health or Google Fit courtesy of the Misfit app, so take your pick, but we'd like to highlight the Misfit Ray – it's comfortable and stylish, and because it uses a watch battery, you can go for months without having to fit a new one. As well as LED lights on the tracker to alert you to notifications on your smartphone, the Misfit Ray tracker is able to monitor steps, sleep, calories and distance. It's fully waterproof as well, and can even offer simple controls for a variety of compatible smart home devices. Polar makes a number of very good fitness trackers and they all work with Google Fit and Apple Health. The Polar A370 is one of the best of the bunch, offering all-day heart rate tracking, advanced sleep monitoring and the ability to automatically identify activities. There's no on-board GPS here, so you need your phone with you to do any kind of location tracking, but thanks to the integrated display you can get basic smartphone alerts on your wrist. The tracker is water resistant too, and comes in a choice of six different colours. A lot of wearables and smartwatches will attempt you track your heart rate for you through your skin, but for really accurate readings, the pros use a chest strap. The Wahoo Tickr X is one of the top buys around at the moment, and works with Google Fit and Apple Health. The device captures the motion and the intensity of your movements as well, feeding back for more details than a simple wrist-based tracker could ever hope to. Thanks to its internal memory and on-board Bluetooth, all the syncing can be done after your exercise. If all of the rest of your gadgets are becoming smart, you might as well add some extra intelligence to your bathroom scales as well, in the shape of the Nokia Body Cardio Scale. The device works with both Google Fit and Apple Health, as well as Nokia's own app. As well as measuring your weight over time, of course, the Nokia Body Cardio Scale can also calculate your BMI and even track your heart rate, so you can get an advanced set of readings transmitted to your smartphone and your installed apps via Bluetooth or Wi-Fi.